At this beginning of Advent, Jan welcomed us, God's people to worship and celebrate the coming of Jesus. In you O God we put our hope and trust. We put our hope in you. In you O God, we put our hope and trust. Hymn TIS 265 "O come, O come, Emmanuel." As we welcome Jesus into the world with this hymn, I think of how we welcome him daily into our lives, to grace our thinking and feeling as we reach out to those around us offering God's love. Prayer of Praise and Thanksgiving Jan prayed for us, speaking of how Advent is a time of promises and possibilities, when all sorts of things and all types of people are ready to flower, ready to emerge. For this we will wait and watch prayerfully expectant. It occurred to me that there are times when we fail to turn to God and ask for his guidance and creativity in our lives. It was for this neglect that Jan asked forgiveness and declared that because of God's grace that forgiveness is ours. We responded Thanks be to God. Our other Jan, then explained the origin of the lighting of the Advent Candles and referred to other symbols of Christmas such as Christmas bush. Alexis then lit the Candle of Expectation. For my family, this is the time when we write a Christmas letter, sharing with friends and family all the blessings God has bestowed upon us in the past year and for which we are grateful. The Announcements followed, including one about the time of fellowship that would follow the service during the Friendship Circle Morning Tea and also one about having raised approximately $2400 in the Lamington Drive. Well done everyone! During the Offering the Men's Group sang, reminding us that all of us have been given talents we can offer to God's service. We then sang Hymn TIS 164 "The great love of God, is revealed in the Son" This Son came to this Earth to redeem each one of us and by flowing through us lightens burdens and creates new people, fit to show God to the world. Readings: Brought to us by Stephen: Jeremiah 33: 22-16 "This is the word of the Lord." God promised that "this place of waste" would by God's power "be pasture for shepherds resting their flocks." God is about healing and restoration. Our country. Our city. Us. The planet. All Creation. Luke 21: 25-36. The Evangelist tells his listeners that just as we know when summer is upon us that we will know when the Kingdom is coming. For me that is now, evidenced by people rising up against injustice to others and to the planet. I'm not expecting extraordinary events but simply people choosing God's way to make a kingdom operating according to his will! Evil only prevails for so long before God raises up leaders to reverse its effects. Sermon Jan spoke on the theme of "Keep travelling with Jesus, seeing the signs of his coming." Jan focussed our attention on today being the beginning of the Church Year, when we start preparing for the coming celebration of the birth of Jesus and that we are the Church of Jesus. Alluding to the reading, Jan spoke of the various signs of the changing season, which led on to thinking about the many predictions of the coming of Jesus in the Old Testament. The Jeremiah reading refers to a time when the cream of the Jewish people had been taken into exile and the Temple had been destroyed. They thought God had deserted them but they came to realise that God was with them...always...with or without a Temple. Similarly, we can worship God wherever we are (not just in church or in our daily devotions) but in and through our daily activities. The Jewish people had to wait while God did his work among them before they had their land returned to them. We may have to wait too, while God carries out his plan for us, whatever is going on around us, God holds us close. We keep on travelling because we know God has given us work to do but we can only do that work through his love and grace flowing through us. "It is only as we enter into a relationship with God through Jesus, that we find the power to change and we then allow God to give us forgiveness and peace." And then: "As God works in us, we can help bring about God's justice and righteousness into the world." So, with another Advent "Let us draw near to God, trust God's promises and keep travelling with Jesus into this new time of seeing what God is and will do to keep bringing hope, peace, joy and love into the world." Amen. As One Voice Bk 2 No. 3 "Christ be our Light" Longing for light, we wait in darkness. Longing for truth we turn to you. Make us your own, your own holy people, light for the world to see. We humans long for what is missing. The greatest discovery we can make is that that longing can only be met by God. Musical Interlude A time for private prayer and contemplation. Hymn TIS 272 "Come thou long expected Jesus." "Let us find our rest in thee...joy of every longing heart...now thy gracious Kingdom bring...raise us to thy glorious throne." Enough said. Blessing The peace of God, which passes all understanding, keep your hearts and minds in the knowledge and love of God and of his son Jesus Christ. And the blessing of God Almighty, the Father, the Son and the Holy Spirit be among you and remain with you always. This service was my offering and therefore I am going to try to share as much as I can with you. Our God of all, who is our east and west, our height and depth, we thank you that you are the constant in our lives. When everything else seems to be confused, we can depend on your faithfulness to us. When life seems to be throwing up insoluble problems, we can depend on you for guidance. We thank you for the bountiful gifts of goodness you shower upon us: the enlivening sight of blue sky, the freedom in the smell of wet grass, and the comfort of a caring hand in ours. We give thanks for that warm gladness that comes upon us when we are in the company of other believers, secure in the knowledge that you are with us. We praise you for your goodness that saves us and this world from its path of destruction and we praise you for your creative power that stirs our inner life and infuses us with joy. We praise you for your healing touch that can mend and restore broken lives but most of all we thank and praise you for choosing to walk with us, transforming such ordinariness into lives of abundance through your grace. Amen. We have seen the example you have given to us in Jesus, who has shown us what human life can be like and in that is our hope. We mean to follow that example, Lord, glorifying your name, but in the rush of everyday life, how often we look to our own so-called wisdom. We know better, Lord, and experience tells us that our way always fails us, but we persist and only turn to you when everything else doesn't work. There are words that we have said for which we are sorry. There are actions which we have taken for which we are sorry but most of all, we are so very sorry for the hurt we have caused. Forgive us, teach us, remind us, help us build paths of truth by relying on your grace. Lead us into your presence, that we may know your will and live accordingly, for we ask in the name of Jesus. Amen. Hear then God's words of grace to us: Our sins are forgiven. Hymn TIS 272 "Come thou long expected Jesus"
That as the scriptures are read and your word is proclaimed, we may hear what you are saying to us today. Amen. Bible Readings: Psalm 16; Mark 13: 1-8 Malcolm. Sermon. My reflection focussed on the reading from Mark and his purpose in encouraging the Roman Christians who were facing the first of the brutal persecution. I pointed out that Jesus predicted violent opposition and that Mark was assuring the Roman Christians that they were right in still following Jesus. I then pointed out that modern leaders, Christian and otherwise, had been assassinated for defending just causes and while we may not have to die for our faith we may suffer in other ways. And our reward? To see this I turned to the Psalmist whose confidence in God's continued blessing and whose confidence in God being the only source of good gives us a firm foundation for trusting God utterly. Amen and Amen. Hymn TIS 589 "Jesus calls us o'er the tumult"
Hymn TIS 105 "Let all the world in every corner sing"
Blessing Margaret - Now to him who is able to keep you from falling, and to make you stand without blemish in the presence of his glory with rejoicing, to the only God our Saviour, through Jesus Christ our Lord, be glory, majesty, power, and authority before all time and now and forever. Amen. Sung Blessing TIS Hymn 778 Shalom. Let us worship God, our light and our salvation. The Lord is the stronghold of our lives. We desire to live in God’s house and to seek God in his holy temple. We have come with shouts of joy, to sing and to make music to the Lord. Let us worship God in spirit and in truth. in this hour of worship and always. Hymn: TIS 52 “Let us sing to the God of salvation” We sang to the God who is our rock...our everything! Deokhee praised God on our behalf, calling on our loving God for whom we had gathered together, seeking to worship him. Deokhee praised God for being the beginning of all life who has known us from before we were born. He acknowledged that God knows our innermost thoughts. When I think about life and the idea of anything being alive, something like spaghetti starts to form in my brain. Life itself is beyond comprehension and is our greatest clue to the existence of God. And I wonder how many of us try to pretend in the presence of God. Before this God we confessed that we had sinned against him and against other people. We confessed that we have only cared about ourselves and asked for forgiveness in Jesus' name. Amen. Then in the name of he who died, rose and reigns Deokhee declared that the old life is gone and the new life begun. Thanks be to God. Children’s talk: Deokhee involved the children through a little quiz, starting with what we call people from various countries. Koreans come from Korea; Americans come from America and so but it broke down when he got to Australia because the answer then was "Aussies" but that did not prevent him drawing out the point that people who belong to Christ are called Christians. This was followed by a very catchy chorus which Deokhee ably led. We then offered each other the Sign of Peace which is a significant opportunity for all of us to declare our love for each other. Offering While the offering was being received the Men's Quartet led us with "When the Saints Come Marching In" after which Deokhee dedicated our gifts to the glory of God. Hymn: TIS 745, “Seek ye first the kingdom of God” Deokhee can really sing and this enhanced the congregation's effort to sing this hymn with its cogent message as a round, producing a lovely offering in song form. 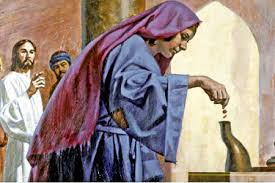 Deokhee spoke on the bible reading from Mark, focusing on the offering of the widow whose few coins would have gone unnoticed in the clatter of all the coins being offered. But Jesus noticed. Keep that in mind when you don't think you have much to offer. He then spoke of a time when he was helping out at Parramatta mission, which is very noisy around mealtime. There in the middle of the noise of voices, plates and cutlery there sat and old man, saying grace. He was offering all he had..his thanks. Deokhee also told of the widow approached by Elijah for food. She only had enough flour and oil left for a final meal for herself and her son before they surrender to death because of the famine. However Elijah convinced her to share that meal with him promising that God would provide. God did provide and the widow had oil and flour until the famine ceased. This service has been about ordinary people doing ordinary things which have been seen as being of great value. We don't have to move mountains to carry out the mission God has given us, we simply have to be true of heart. Hymn: TIS 342 “When I survey the wondrous cross” For so many Christians all around the world, this is central to their belief and their lives spin on this axis. During this time we thought about our own concerns and those close to our hearts, whether they concerned loved ones or people whose lives are being destroyed by injustice in so many places around the world, including in our own country. Prayers of Intercession – Deokhee prayed for healing and comfort for those who are sick and suffering. He prayed to our most gracious God, thankful for God's belief in us to carry out his work, declaring God to be the mystery that binds us together. 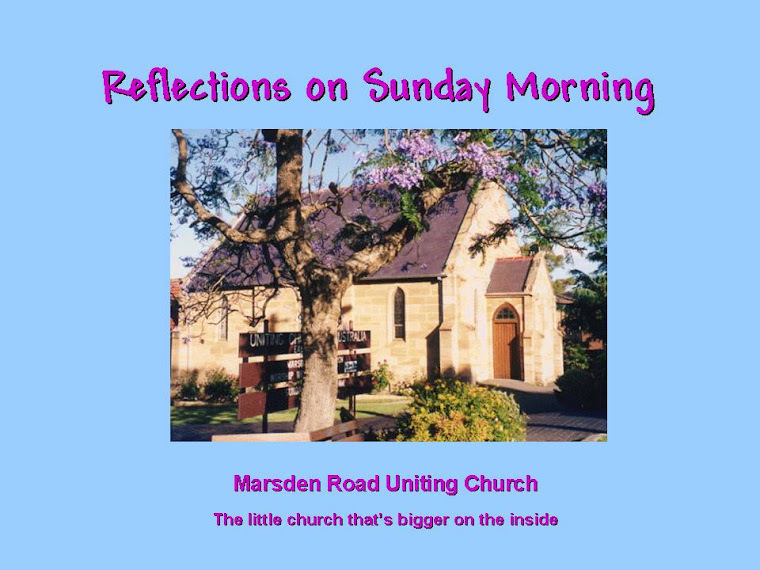 He asked for God's hand upon those who share the heavy burden of political leadership and for those who lead Marsden Road and Ryde Uniting Churches. Amen. Hymn: TIS 256 “From heaven you came, helpless babe” God came as a servant and now he asks that we serve him and each other. The blessing of God, the Father, Son and Holy Spirit be with you and remain with you, always. Hymn TIS 778 “Shalom to you now” A more powerful blessing does not exist as we pray for every good thing for others. Welcome- All Saints Day-Those who could, gathered outside to recall that it has been 150 years since the foundation stone was laid, giving thanks for all those who grew this church. We then entered the church singing Hymn TIS 455 ‘For all the saints who from their labours rest' Thanks was given for all those who have gone before us, who established this church through the grace of God, in which we are nurtured. We give unending thanks and praise to God but the saints who have preceded us have been his hands and voice. Together we follow the lead of freedom and justice. Together we love God and neighbour with our all. Together we put our trust in God, our Saviour. This prayer was a reminder that it is through trust in God that we find our strength, our encouragement, our friendships and our certainty when we are uncertain. We declared our trust in God for all things. The story of Ruth and Naomi challenged us to reflect on our own faithfulness, and who or what we see as our source of strength when circumstances become difficult. It made us reflect on our faithfulness to the people and causes to whom we have pledged commitment. Then we asked forgiveness when we fail, as we do. Hear then God's words of grace to us. Our sins are forgiven! Thanks be to God. Remembering those who have followed Jesus, who have taught us, loved us, inspired us and encouraged us. Those who wished walked forward to light tea light candles and gave thanks for those who have gone before us. Offering The offering was dedicated to the work of spreading God's love and grace. Hymn TIS 537 “Let us talents and tongues employ” This song encapsulates the experience of communion. We feel joined with each other as we, together, open ourselves to God's healing, restoring us to wholeness, fit to do his will in the world. This hymn was sung with much confidence, reflecting our faith in our source. Christ our Lord invites us to his table: all who seek him. This is my body and blood which is given up for you, for the forgiveness of sins. Holy, holy, holy Lord. God of Power and Might. Heaven and Earth are full of your glory. Hosanna in the highest. Lamb of God, you take away the sins of the world, have mercy on us. Lamb of God you take away the sins of the world have mercy on us. Grant us Peace. The Distribution We remained seated while Jan, Ruth, Elaine and Carolyn distributed the elements. When all the bread was distributed we ate together, and when all the juice was distributed we drank together. Together with God and with each other. Prayer after Communion We thank you that you have fed us in the sacrament, united us in Christ and given us a foretaste of the heavenly banquet prepared for all people. Amen. Bible Readings- Ruth 2:1-23, 4:13-17 Faithfulness is the theme. Ruth's faithfulness to Naomi; Boaz faithfulness in looking after Ruth's welfare in the field because of her faithfulness to his relative Naomi and Ruth's faithfulness to Naomi, even after her position was secured by her marriage to Boaz. And God's faithful love to two woman who were faithful to him. Mark 12: 28-34 Jesus is quizzed about which of the commandments is the greatest. Clearly a ploy to entrap him. However, Jesus answered in a way that covered all the commandments and more, leaving his opponents with nothing to say. Sermon- ‘LIFE for Naomi and Ruth through the loving kindness of God’ Jan began with reference to the disasters that strike people and how, as a church, we respond. She reminded us that we do not have to face such disasters, where people have no idea where their next meal will come from. But Naomi and her family did have to face such a situation which resulted in them being in a foreign country with the sons growing to adulthood and marrying women from that country. But that good outcome changed, with Naomi's husband and both sons dying, leaving three widows. Naomi realized her best option was to return home but thought it best for her daughters-in-law to stay in their country and marry countrymen. One agreed but Ruth did not and said: 'Don't urge me to go...Your people will be my people and your God my God." 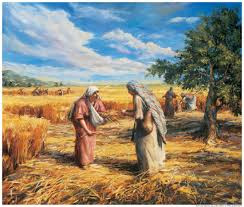 Naomi, kept a watchful eye over her and saw that she was able to glean with success and without being harassed, thereby providing for herself and Naomi. According to the law, a closer relative had a claim over Ruth and her father-in-law's land but when he relinquished his claim, Boaz married Ruth, so that her position and that of Naomi was secure. A situation of grief and loss changed into a secure life of love with hope for the future. God was faithful. Ruth and Naomi were faithful to each other and Boaz was faithful to God and to his responsibilities. It turned out well. A thought. Only God could know how well things would be but Ruth, Naomi, and Boaz didn't know but were faithful because they saw it as the thing they had to do. Situations arise like that in life. There are times when we have to be faithful, whether it will profit us or not. We simply know we have to. Hymn TIS 683 “God, when human bonds are broken’ When things are broken between us and others, give us faith, hope and love to send out tendrils to draw people together and allow them to see the bonds that hold them together that are simply over shadowed for a time. Musical interlude before prayer as we contemplated our personal situations. Prayers of Intercession – Delma thanked God for answered prayer and asked God's strength and support for the families of those killed in the Russian airplane crash and those refugees suffering in detention. She prayed for all those wandering the world and all those who offer them the hand of friendship. She prayed to God for those close to us and the carers of the community - teachers, medical workers, Firies, Ambos, Police and the military. Care for them and heal their wounds suffered in the trauma they witness. 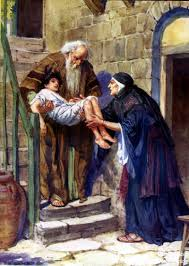 Delma prayed for the church: locally, nationally and internationally and especially the leadership of MRUC that it will spread God's grace to heal this broken world. Hymn TIS 154 ‘Great is your faithfulness’ Despite knowing that this is so, it seems we need to experience it anew so many times to remind us that it is true. It's not that God stops being faithful - ever, but we stop noticing unless there is a crisis. Blessing The peace of God which passes all understanding keep your hearts and minds in the knowledge and love of God. And may the blessing of God Almighty, Father, Son and Holy Spirit be with you now and always. Blessing Song TIS 778 ‘Shalom to you now’ Such an amazing blessing, showering each other with everything God can give to make our lives anew.